Marcus Wills won the Archibald Prize in 2006 with a portrait of sculptor Paul Juraszek, painted in a style inspired by a 16th-century Flemish etching. 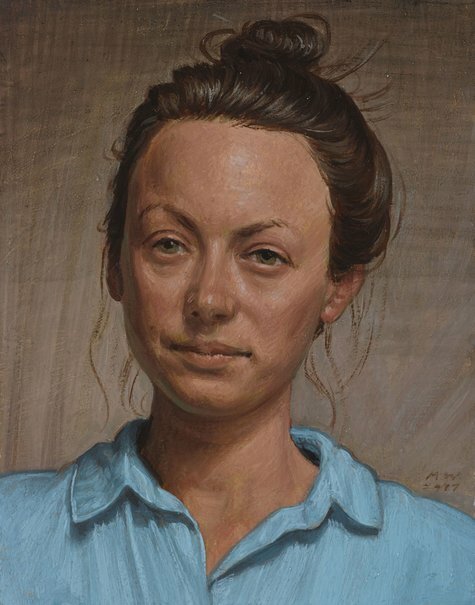 In 2016, he was highly commended for his portrait of dancer, choreographer and filmmaker James Batchelor. This is his fifth time as an Archibald finalist. His subject is actor Lotte St Clair, whose credits include the television series Wonderland and stage productions of Baal and The taming of the shrew . She is the partner of filmmaker and actor Thomas M Wright, who Wills painted for last year’s Archibald Prize. Lotte featured in the painting of Wright, seen in a photograph of her six-year-old self. ‘I started painting Lotte after finishing Tom’s portrait. It’s a smaller, more intimate painting, which is probably more in keeping with my usual practice,’ says Wills. ‘I’m hoping it will be the smallest painting in this year’s Archibald because I believe that last year mine was the largest,’ he quips. As it turns out, Wills is right on both counts. Born in Kaniva, Victoria in 1972, Wills graduated from the Victorian College of the Arts in 1995 and was awarded the 2000 Brett Whiteley Travelling Art Scholarship. He is also a finalist in this year’s Wynne Prize.